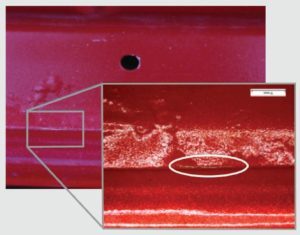 Aluminum Association research into an 2012 factory vehicle hood showing “extensive” filiform corrosion within four years shows the need for repairers and OEMs to be meticulous with the metal. The report is a bit technical, but it’s short — merely 16 pages of text and photos — and it might save a shop from comebacks, so painters, preppers and body technicians should check it out. With more OEMs using aluminum on vehicles — notably on hoods like that studied by the association — it’s possible customers will see more of this filiform corrosion if an automaker or shop screws up. Filiform corrosion, which is different than the galvanic corrosion steel-aluminum contact can produce, typically doesn’t pose a “structural or safety concern,” the Aluminum Association wrote in the October 2017 report. However, the corrosion can generate a “‘paint blemish,'” according to the association — which doesn’t seem like a great advertisement for the OEM or the auto body shop’s product. “(I)t is certainly understandable why the customer would object to such a blemish in a modern vehicle,” the association wrote. Filiform corrosion derives its name from “fine filaments or worm-like tracks” that arise on an aluminum substrate under a coating like paint that otherwise would have blocked the oxygen, the report states. It and crevice corrosion — caused when something corrosive like salt water is between aluminum surfaces or aluminum and anther substrate — are particularly likely “in wet and salty environments typical of the east coast of Canada or the USA,” according to the association. The association also notes that sanding can prompt filiform corrosion, which raises additional considerations for OEMs and aftermarket. The trade group aftermarket comments might be referring to practices like immediately priming or treating the bare aluminum after sanding it, as PPG describes here. 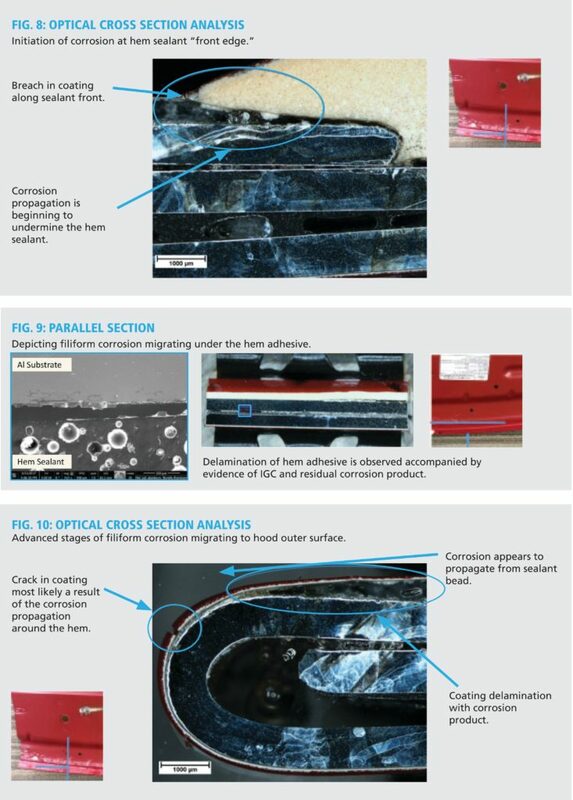 The study also provides an overview of how corrosion protection works — or doesn’t — in hemmed aluminum surfaces at the factory, which should provide a little perspective on what could happen when a collision repairer works on an aluminum hem flange in the shop. The alloy used at the time — it’s since been replaced by a weaker but flat-hemmable aluminum alloys — yielded a rope-hemmed hood which the OEM coated in the typical fashion. Nevertheless, issues at the microscopic level sparked corrosion and provide an example of how repairers and OEMs need to think beyond the naked eye when working with substrates and coatings. It wrote that the adhesive might have absorbed some moisture or had too much oil left on the formed part. 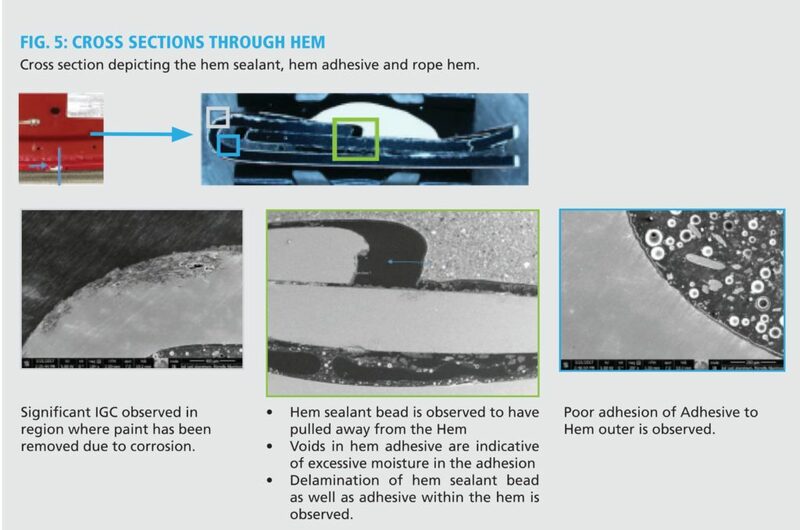 “As adhesives, even cured adhesives, are hydroscopic, which require special attention to see that the adhesives don’t absorb moisture that can degrade the adhesive or the adhesive to metal interface,” the association wrote regarding the factory assembly process. Too many voids left in the cured adhesive speeds up how much moisture sneaks in while the car’s on the road, according to the association. “Eventually, this moisture migrates to the metal adhesive interface, which may initiate filiform corrosion. If the metal surface is well pretreated, filiform corrosion is mitigated,” the association wrote. Extensive corrosion has been observed under the sealer and as a result, some of the underlying layers are difficult to observe. The layers on top of the sealer suggest it was applied at the assembly stage. As previously shown, there are regions where the sealer pulled away from the metal surface, and filiform corrosion is observed at the edges of the sealer. It should be noted that once filiform corrosion has been initiated at the various defects, such as under the hem sealer, it may grow away from this initiation site and under the paint layers. The lack of ZnP or e-coat under the hem sealer, places all corrosion preventative measures to be provided by: the quality of the hem sealer, the cleanliness of the underlying metal, and the uniformity and integrity of the sealer application. This particular example appears to suggest the sealer was unable to provide the necessary level of protection to the underlying metal. 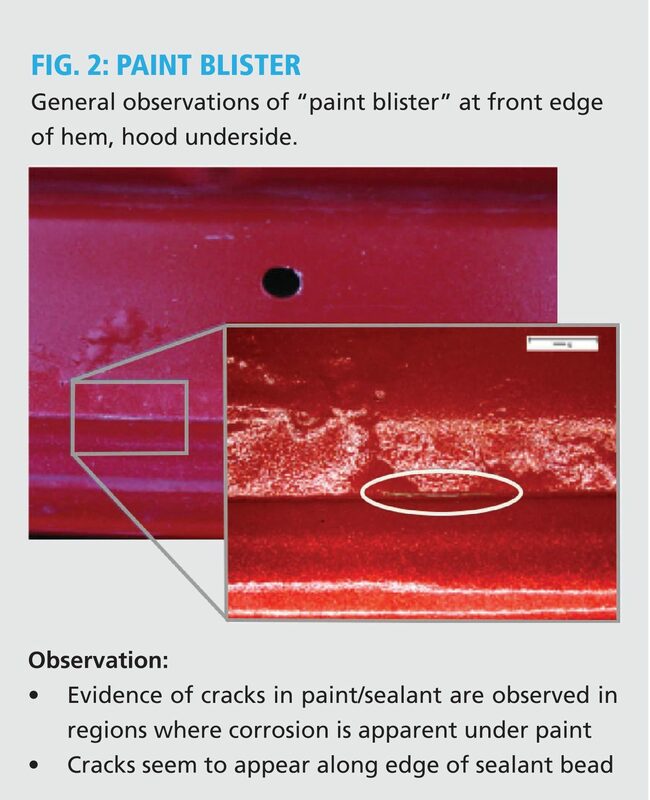 The source of the paint blisters, which are a manifestation of the filiform corrosion, likely started first at the hem sealant “edge” and then migrated into the hem. Once the filiform corrosion was initiated and allowed for the ingress of water/electrolyte additional filiform corrosion events likely began. It is certainly possible that many of these filiform corrosion events began almost simultaneously as the water ingress proceeded under the hem sealant. The porosity of the adhesive and the non-coherent ZnP layer adjacent to the hem probably contributed to the rapid “spread” of the filiform corrosion event(s). 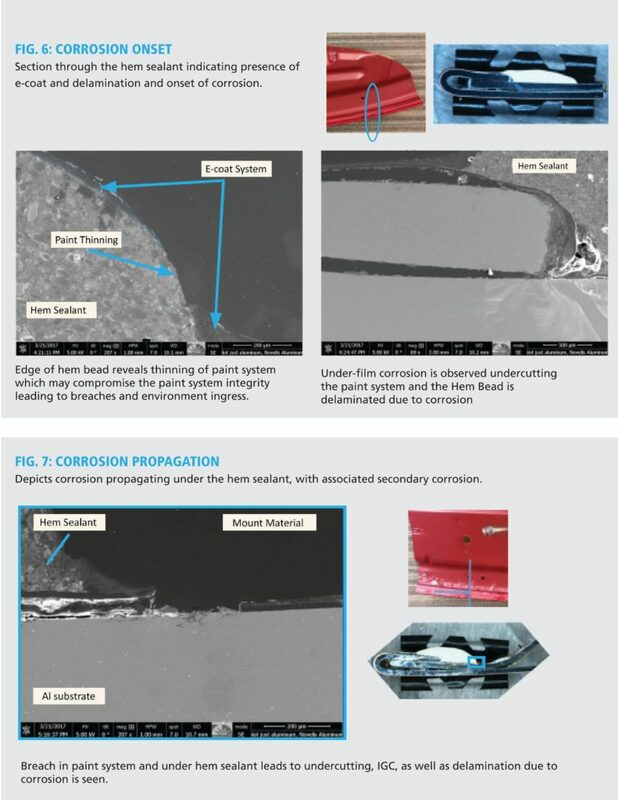 Corrosion, once initiated from a paint defect or hem sealant edge, can either be arrested by the pretreatment layers or, if the pretreatment and surface conditions are not robust, transition to filiform corrosion and migrate under the paint layers. Effective prevention usually requires that the corrosion initiation events are minimized or delayed; though in practical terms, it is very difficult to eliminate all initiation sites. The rate of filiform corrosion is mitigated with a strong paint to surface interface which causes the growth rate to become insignificant. The study also reported that work is underway to create tests designed specifically for aluminum filiform corrosion, for existing tests might have been too steel-centric. Hopefully some of that research provides new lessons for the aftermarket as well.